I thought somewhere was a request for info on the origin of the name. According to Dictionary of British Surnames by P. H. Reaney (1961), the names Hubbold, Hubball, Hubble come from Anglo Saxon HUBOLD for "mind bold" This comes from Old French Hubaut. The introduction of Hubbell Pioneers is called "The Beginnings." 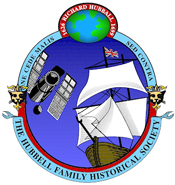 It tells of Richard Hubball (later Hubbell), the first Hubbell in North America, who came from England to what is now Connecticut over 350 years ago. Richard was born in 1626 in Ribbesford Parish near Bewdley not far from Worcester in England and was a teenager when he arrived in New England. He was supervised by his maternal uncle, John Wakeman, a merchant and magistrate in New Haven Colony. About 1650 Richard married Elizabeth Meigs and the couple settled in Guilford when they started to raise a family. After ten years they moved to Fairfield. There Elizabeth died leaving her husband and seven children. Because of economic and domestic needs Richard sought another wife and in 1669 married Elizabeth Gaylord, a woman 20 years younger. After 20 years of marriage and four children, Elizabeth died. That same year Richard, who was 62 years old, married Mrs. Abigail Walker, a widow, who bore him two sons. Richard is listed as a "planter" in colonial records. He also bought and sold lands for personal gain. As his children reached maturity, he gave portions of his property to them. In 1662, Richard became involved in a serious political matter between New Haven, which was an aristocracy, and the Connecticut Colony, which was more democratic. The Connecticut Colony, which Richard supported, was brought to trial for sedition. It appears that the group was acquitted although records are incomplete. The two colonies were united in 1665. After a full and prosperous life, Richard died in Stratfield Parish in 1699, survived by 11 of his 14 children. He was laid to rest with his second wife, Elizabeth, in the Stratfield Burying Ground. His will, which was drawn up about six months before his death, is still preserved in the archived of the Connecticut State Library at Hartford. It lists a detailed inventory of his possessions and is signed with his initials and has his seal in red wax. Of Richard's children two each bore the names of John, James and Samuel and were distinguished from one another by using Jr. or Sr. Seven sons and at least four daughters had children of their own. 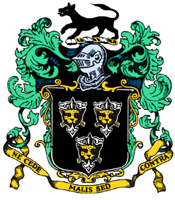 One son, Richard, had eight children and became the founder of a large branch of the family. Another son, James, lived to reach the age of 104 years. The second generation remained in Stratford, Fairfield and the Stratfield limits and vicinity. Many members of the third generation settled in various towns in Connecticut. Nathaniel, the first in the family to graduate from Yale, moved from Connecticut to Pennsylvania and later settled in New Jersey. Elnathan Hubbell moved to Bennington, Vermont. David went to Courtland Manor, New York. "The Beginnings" tells of some of the many activities of the early descendants of Richard. They raised families, settled the land, held positions in their local governments, ran businesses, and served in the armed forces among other things. Early Hubbells took part in a good many conflicts including King Phillip's War, King William's War, and the French and Indian Wars. Hubbells were active in both sides of the American Revolution. Many fought on the side of the Americans while others fought in British or Loyalist units and some fled to the mother country or to Canada. "The Beginnings" tells the stories of some of these Hubbells. Many Americans were better off at the end of the war than at the beginning because it stimulated manufacture and production. Wages increased and a new group of entrepreneurs, merchants and businessmen appeared. At the same time many suffered losses and were owed money by the United States Government. Some of these were recompensed with grants of land on the frontier, such as the Western Reserve and Firelands sections of northeast Ohio. The combination of new enterprises, of war losses and increasing population led to greatly increased migration west. Richard Hubball's descendants were part of this movement. The stories of many of these family pioneers are recounted, sometimes in their own words. Thus, the history of the growth of the United States and Canada is told in the narratives of Hubbell Pioneers. Descendants of Richard HUBBELL/HUBBLE, Sr.
........................................................................................... +Cecil B. (Cooch) WITTEN b: December 18, 1898 in North Tazewell, VA d: December 08, 1979 in Tazewell, VA (Buried in Maplewood Cemetery) N. Tazewell, VA Died from pneumonia at 11:00 a.m.
..................................................................................... 10 RomalouLewis Cass (Buddy) McCOY b: October 08, 1910 d: October 20, 1922 in Tazewell, VA (Buried in Maplewood Cemetery) N. Tazewell, VA Died from pneumonia at 11:00 a.m.
....... 2 Richard HUBBELL/HUBBLE, Jr.